Gypsy Warrior denim jacket. Gypsy Warrior skirt. YRU shoes from Tilted Sole. I shot a couple outfits with Tilted Sole the other day, and this one was one of my favorites. I dressed in a 90s grunge-inspired look that hearkened to my teenage years. 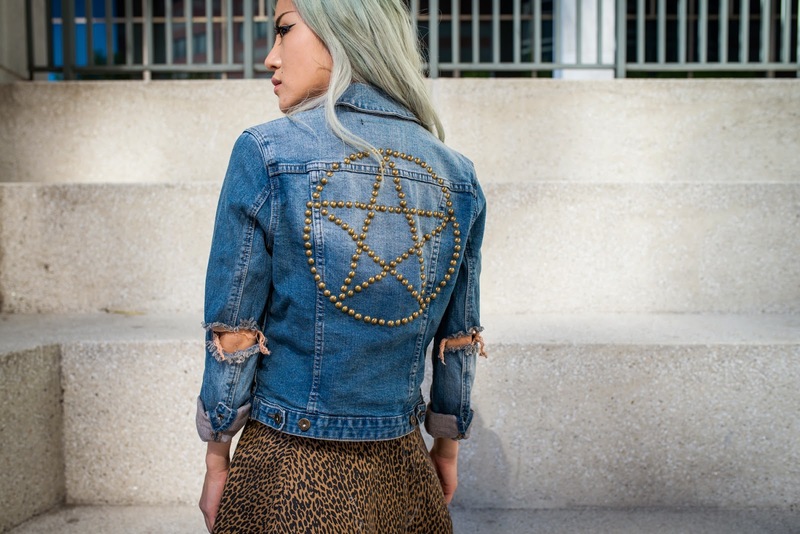 This leopard skater skirt comes in a faded denim fabric and the most awesome flouncy circle skirt shape, and this faded and distressed denim jacket (an essential this spring/summer, and a Gypsy Warrior exclusive) has a studded star on the back and busted elbows! I'm all about busted joints on my clothing. Paired with these sky-high yet comfortable YRUs, this getup appeals the rebellious, angsty 90s baby in all of us. Love the shoes they are awesome! super rad studs on the back of your leather jacket and i'm obsessed with your platform sandals! Platform docsssss.... I need I need.